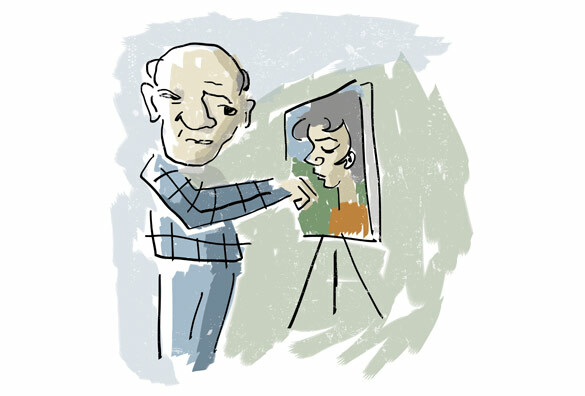 Picasso was in a park when a woman approached him and asked him to draw a portrait of her. Picasso agreed and quickly sketches her. After handing the sketch to the woman, she is pleased with the likeness and asks how much she owes him. Picasso replies: “$5,000”. The woman screamed, “but it took you only five minutes!”. “No madam, it took me all of my life”, replied Picasso. While there are varying versions of the above story, it’s an inspiring one for any designer, artist or creative who has dealt with clients not understanding the value of a lifetime of skills acquired. Sure, we can’t all charge $5000 for 5 minutes of our time…but we should be charging enough to justify the time and financial investments that are required to offer a quality service. This story inspired me to create a poster to share with fellow designers and creatives. Hang it on your office wall to remind clients of the hard work that goes into developing your skillsets. Or use it as you wish. I just ask that you obviously do not sell this design, or use it for anything other than personal use. If you’d like to share this on your website, please ask my permission and provide me the details of usage. 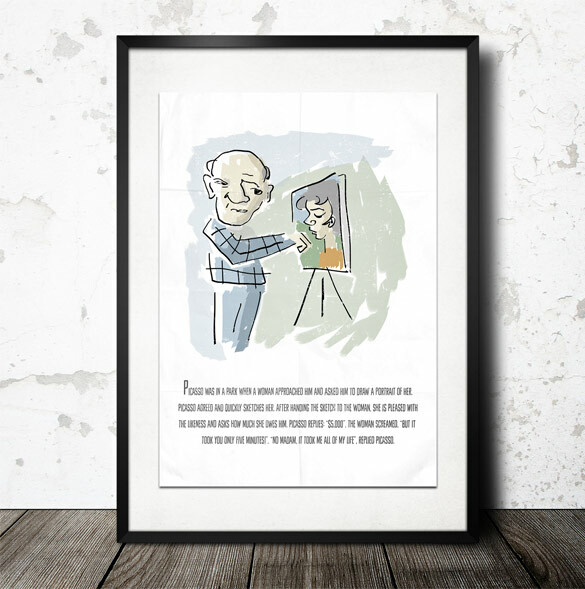 Download the Picasso poster design here. The poster includes the story quote mentioned at the top of this post. File specs of the download: 16″x20″ dimensions, jpg format, 300 dpi, cmyk color mode, file size of 7.2mb. If you’d prefer a copy of this image for screen viewing instead (ex: desktop background), just convert the file to srgb in Photoshop or shoot me an email. If you like this design, please let me know by commenting below. Thanks! Great story and really nice poster.. still so relevant to creatives of today! Thanks Franky. Yeah the reply by Picasso is spot on.